I should call Anne. She’ll know how. Oddly, I’d planned to make the ketchup with no prior knowledge of the french fry plot. I was just eager to try making ketchup with all the juicy tomatoes available at my farm market. I get inspired to try silly recipes when I read them on the dock in Maine. Usually I tear them out and quickly, wryly, tear them up when reality hits me again, back at home. Oddly, the only place I could find the recipe was on Yahoo! Shine. Two reactions: why are so many magazines so poor at indexing their content? (OK, I know, dying businesses don’t invest.) Second: Hooray for Yahoo! Shine. We have a nice relationship with them at Daily Grommet and I think they are really trying to run good content. 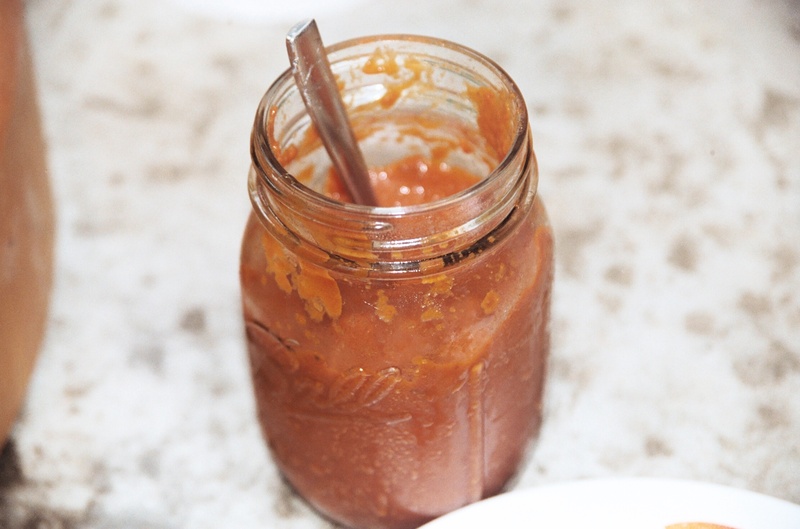 Here’s one “No-I-am-not-crazy” reason to make homemade ketchup, that I just picked up on Yahoo!….the third ingredient in commercial ketchup is high fructose corn syrup. In making this ketchup, I finished up my precious bottle of French apple cider vinegar I bought at an Irish farm market. It’s my secret pie crust ingredient. I hope I can find the same Stateside. Teenage boys are changing. Cooking is cool. I took this same trio to the mall last night. Visiting Williams Sonoma was their second requested destination. “Dinner” was first. I was quietly waiting for “Game Stop,” but it never came up. My end result--took me a month to get the photo inserted here....I still sometimes use a film camera, with the whole processing lag time thing. Hi – I just came across your cool blog from HARO, and I’m loving it – I spent a year in Ireland in the late 70s – sob. One of my fondest memories from my childhood is being at my aunt’s house on the river and deciding to make ketchup. I put a tomato on top of an empty bottle – and figured that it would just slowly drain into it. !!! Dumb, huh? I watched that thing for days! Cindy….That tomato ketchup story cracked me up. Someday I’ll write a blog post about my childhood belief that I was the only person on the planet who could see molecules in the air. Your ketchup experiment is not all that dumb, comparatively. And kind of creative for a little kid too.